The almond is a species of tree native to the Middle East and South Asia. “Almond” is also the name of the edible and widely cultivated seed of this tree. The fruit of the almond is a drupe, consisting of an outer hull and a hard shell with the seed (which is not a true nut) inside. Shelling almonds refers to removing the shell to reveal the seed. 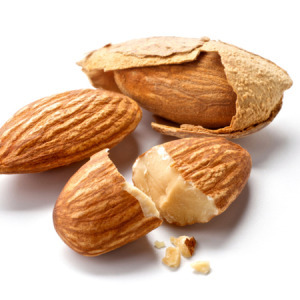 Almonds are sold shelled (i.e., after the shells are removed), or unshelled (i.e., with the shells still attached). While the almond is often eaten on its own, raw or toasted, it is also a component of various dishes. In Greece, ground blanched almonds are used as the base material in a great variety of desserts In Iran, green almonds are dipped in sea salt and eaten as snacks on street markets.